A Thesis Submitted to the Faculty of the School of Film and Digital Media in Partial Fulfillment of the Requirements for the Degree of Master of Fine Arts in Interactive Design and Game Development. Note: As of 2018, these studies are best viewed in Safari or Chrome. Many make use of custom cursor behaviors that are obscured if the browser prevents Flash from hiding the system pointer. My investigation centers on the creation of a series of studies; each one attempting to apply my language of manipulation both perceptually and computationally in order to create novel interaction from otherwise simple items and identify where the definition is ambiguous, logically problematic, of computationally non-applicable. They are listed in the order in which they appear in my paper. These studies expose both opportunities for revision, more sophisticated questions about the nature of interactivity, and a growing code library that provides computational equivalents to statements about manipulability. I have also created a very simple GUI allowing for some limited direct manipulation of manipulable qualities. The Manipulus library allows for persistent relationships to be established between any two properties. This is commonly known as data binding. The most basic use of the Manipulus library is to "Bind" one property to another — to create a one directional bond between two properties. The first property (The driver) is freely changeable, the second property (the driven) will always match the first. The Manipulus library supports some special properties like pressed (Boolean) and touched (Boolean) that do not exist in Actionscript by default . These properties are read-only and only applicable to DisplayObjects. The Manipulus library includes a Clock class with properties like seconds and time. You can use these properties to drive other properties, creating basic animation. There is also a Cursor class with the following properties: x, y, pressed. The bind command returns a relationship, an object with properties active (Boolean) and mapping (Function) that can be driven by other properties, such as 'pressed'. In addition to bind(), the library supports binding changes in values via bindChanges(). The difference can be seen below. Circle1 snaps to the cursor when dragging, whereas circle2 follows it. Custom functions can also be used as Mappings, so long as they accept one argument. Sets are like Arrays, except they have a couple additional properties like angle and distance that provide information about the relationships between the items inside of the set. A reference is like a pointer. It's a variable that is always equal another variable. It can be created with the shortcut function $(object:Object, property:String ) or Binder.createReference(object:Object,property:String). When used as a number, the reference becomes the value of the property it points to, when converted to a string it turns into the name of the object and property it points to. Interaction is experiential but also computational. Creating interactive artifacts requires programming which is difficult and time consuming. Programming also requires a clear understanding of the artifact's desired behavioral qualities. Unfortunately, the qualities of interaction are nebulous. The interactive qualities of a specific concept may be inaccurate, malformed, or simply ineffective in engendering the envisioned experience. Better understanding is predicated on an ability to quickly create and experience different interactive possibilities, but this is curtailed by the difficulty of programming. The problem is circular. Ambiguities in our understanding of interaction make programming more difficult which in turn obscures understanding of interaction. This thesis addresses the issue by proposing a model of single-user, screen-based, interaction as an emergent quality of manipulation that includes low level qualities both perceptually descriptive and computationally tenable. A series of simple, non figurative, interactive, studies is created to test where the model may be deficient, ambiguous, or computationally problematic by probing potential boundaries between manipulation and interaction. Though the model is input device agnostic, investigations are limited to mouse or trackpad input. Lastly, an Actionsript 3 library for creating relationships based on the model is included along with a rudimentary interface prototype that allows for the direct manipulation of a limited set of the proposed qualities. As an ongoing area of research, the study of interaction comes with a variety of definitions and overlapping usage of the terms interactive, interactivity and interaction for reasons both historical, perceptual, and colloquial. Dag Svanæs provides some clarity on the general definitions of these terms (5); Interaction refers to the reciprocal action between a person and a computational device. Interactive refers to an artifact's ability to support interaction. Interactivity (noun) refers both to the topic at large, and also a specific artifact's interactive qualities — those qualities, whatever they may be, that make it distinct from other visual and kinetic artifacts. The ambiguity of these qualities creates particular problems for criticism, analysis, and tool creation but particularly in design as it interferes with traditional iterative design practices. In fields like graphic design, potentially nebulous initial concepts are quickly explored to find the most fruitful direction for investigation. The specifics that contribute to the gestalt of traditional form (point, line, plane, texture, volume, etc.) are relatively well understood (Ware, Hannah), and isolating the most effective combination of these qualities to provide a generalized outline of a potential solution is central to initial exploration. Unfortunately, interactive qualities that contribute to the character of an experience may not be observable in traditional sketches or layouts. Interactive artifacts, while predominately visual and kinetic, often posses qualities that are only apparent during a direct and active encounter (Löwgren and Stolterman 137) and may remain hidden until an interactive version of the artifact can be encountered. This would be less problematic if the actual creation of functioning prototypes was less difficult. I will address the pragmatic and conceptual issues in the next two sections. Addressing the difficulty of creating prototypes is a common and useful approach. The general idea is that reducing programming difficulty or improving programming knowledge leads to more and/or faster exploration and from this more experience and understanding of interaction and interactivity. An interactive artifact in the most technical sense is a continuous, interruptible, process running on a computer that controls the creation of visual forms that vary in response to a context outside of the artifact. Programming languages provide the precise detail needed to annotate these processes in a manner a computer can execute. While often an immutable and essential task in creating the artifact, creating and modifying these programs to produce desirable and innovative2 results is both difficult and time consuming (Buxton 97). Some methodologies aim to separate and isolate programming from the more design task at large in order to minimize the difficulties in programming — specifically to avoid a lack of conceptual integrity and correspondingly ambiguous and costly implementation needs (Brooks 42). These methodologies emphasizes a view of programming as the production work of a fully formed idea (Reas et al. 25). The aim is to minimize the risk of complicated development issues by strictly defining the needs of the program. This was a goal of the waterfall development methodology (Brooks 266) which assumed that development problems arose more in execution than in preliminary design. More contemporary user centered design practice acknowledges that major problems stem from problematic concepts but still contain the implicit goal of deferring programming: High-fidelity prototypes are difficult and time consuming to create; best to do it as late as possible (Sharp, Rogers, and Preece, 395). In game design instruction, the programming problem is sometimes avoided by emphasizing the creation of board games over digital games — in these cases a student/designer must still create an algorithmic system but with the leniency that it need only be executed by people opposed to computers. This phenomena is mirrored in the digital product realm through the use of paper prototyping techniques. While pragmatic in concept, this approach is at odds with traditional iterative practices found in graphic and industrial design. (The approach is also problematic from a development standpoint as the creation of software often involves the uncovering of new problems unaddressed in initial specifications (Brooks 266)). Iterative practices, as Colin Ware describes, emphasize a designer's repeated encounters with evolving manifestations of their ideas; each iteration modified in order to balance the complex requirements of audience, subject material, and medium (158). While the visual qualities of an interactive artifact may be easily prototyped using the designer's intuitive visual problem solving abilities and drawing skills, rapid prototyping — or sketching — of the interactive qualities of these visual forms is in some cases reliant on a designer's programming skills and, more importantly, their ability to identify and abstract potentially complex behaviors that may be central to the artifact (Gingold, “Catastrophic Prototyping”). While strict in syntax, programming languages are highly expressive. Their abstraction allows writing processes that read input and control output in a variety of contexts completely unrelated to the visual and interactive problems a designer is required to deal with — such as cryptography, database management, or networked communication. Languages like Processing mitigate this by hiding instructions unessential to a designer or artist while providing instructions with more immediate visual consequences. This allows designers to affect screen visuals more quickly and restores some of the continuity of the iterative process. The Processing community even refers to their programs specifically as sketches. This type of approach is invaluable for both full projects and in educational contexts. More ideal though would be a programming language that provides a brief but powerful instruction set for affecting a form's interactive qualities, so that perceived and imagined behaviors could be more easily translated into a computational form and vice versa. As form and interactivity are inseparable (Svanæs 5) such an isolated language may be impossible. However, a better understanding of the subjective experience of interaction may point to a more ideal vocabulary. Interactive artifacts, while predominately visual and kinetic, often posses qualities that are only apparent during a direct and active encounter. This is what Löwgren and Stolterman describe as the dynamic gestalt (137). While an artifact may be visual and kinetic, its interactivity — its interactive qualities — affect how an individual perceives the artifact as a whole, just as color interplays with form to support a static image's gestalt. The results of this interplay are variable. In some cases an encounter may even be of limited import. To better define the scope of this project I will describe some ways a direct encounter may, or may not, impact an experience. Firstly, there is nothing to say that an active encounter necessarily makes for a better experience or that interactivity is a panacea for an otherwise dull or ineffectual design. Active encounters may even be less enjoyable than passive ones. Conversely, modifications to visual qualities may improve the perception of an artifact's interactivity.2 Regardless of the quality of the experience, the simultaneous interplay of an artifact's visual, kinetic, and interactive qualities typically engenders a more comprehensive understanding. It's also possible for an interactive artifact's overall perception, meaning, or significance to be dominated by its visual, kinetic, or narrative qualities. The analysis of games like Uncharted : Drake's Fortune that rely heavily on story and characterization would be appropriately evaluated as a linear art form as much as an interactive one. Parafunctional design is generally appreciated in three steps, starting with a simple recognition of the product and its intended function, followed by a brief period of frustration at the obvious inappropriateness of the intended function and only then a sudden insight (the »a-ha« moment) when you realize what the artist-designer wants to make you see (Five Things I Believe About the Aesthetics of Interaction Design, 7). Lastly, an active encounter may fail to reveal the full nature of the artifact. Some require prolonged or reoccurring use in order to completely understand their qualities, such as the deep abstract relationships in games like Chess and Go. Similarly, some artifacts may influence behavior in ways that are not understood. The effects of social networking sites or violent video games on child social and mental development are particular areas of interest. Outside of these exceptions, interactive artifacts are generally qualified by the value of a direct encounter. The existence of gameplay underscores this phenomena. Games typically have no direct utilitarian use, but may provide a more elaborate, rich, detailed, or full experience when encountered. As a subset of interactive artifacts, games must deal with issues of interactivity along with their own domain specific problems. Here the ambiguity is found again. Game designer Doug Church voiced a public request for an abstract formal language directly. The lack of a coherent model drove Greg Costikyan to write I Have No Words and I Must Design. Jesse Schnell notes that in the absence of clear definitions, designers make do with a variety of lenses (24). While the existence and value of an interactivity is clear, its specifics are not. To my knowledge, at the time of writing there is no broadly accepted model of interaction with the low level detail comparable to that found in traditional design languages concerning gestalt-forming elements. Whether interactivity can be dissected into discreet dimensions as color is dissected into hue, value, and saturation, or form into point, line, and plane is unclear. However there is a wealth of writing on the topic at large, some of which serving as a direct foundation for this project's investigation. Firstly, it is widely held that basic perceptual and cognitive abilities are biologically contingent and thus relatively consistent (Norman Design of Everyday Things, Raskin, Ware). As such, a model of interaction based on potentially universal similarities in the perception of interaction should at least be possible. While the experience of interaction may be contingent on factors such as experience, age, and culture, this project will focus on potentially universal, biologically contingent, qualities of the active encounter. Similarly, Salen and Zimmerman's four part definition of interaction separates a particular mode of interactivity relevant to this project — that kind of interactivity emerging from designed rules (artificial relationships and restrictions). This mode is distinct from other modes such as passive observation (the interactions of two colors in an image) and meta-contextual activities that surround game play (tournaments, trading, planning, etc.) (59). It is noteworthy is that definitions offered by Salen and Zimmerman and some others do not define, exactly, how interactive an artifact must be in order to qualify as interactive. This flexibility is explicitly expressed by Chris Crawford in the Art of Interactive Design where he suggests that even a refrigerator is interactive, if only a little (6). This variability is a necessity for Dominic Lopes when he posits that for a work of computer art to best exemplify its kind it should be more interactive (98). For this project, artifacts that are more interactive may described as exhibiting behavior in response to input that is more varied, nuanced, surprising, or demanding in attention. In contrast to these open ended views, Malcom McCullough's definition of interactive makes a distinction between items which are interactive and those that are merely operable (Digital Ground 20). That there may be a common perceptual distinction between those things that are accepted as interactive and those that are not — even while the interactivity of such artifacts may be variable — has led this investigation to focus on simple artifacts straddling the line between the two categories in hopes that a perceptual distinction may become more apparent. My experience outside of this project is that direct encounters have the most noteworthy impact in cases where the artifact is designed to support direct manipulation. This kind of interaction is distinguished by a continual change in response to continual input. Simple (operable or manipulable) examples include scroll bars and moveable windows, complex examples are found in the control of an avatar in most action video games or the interface of a video editing suite. Direct manipulation is noteworthy in that it is often effective and enjoyable (Shneiderman). Steven Swink discusses this kind of continual manipulation as being central to the interactive feel in games (2). Despite aesthetic or utilitarian efficacy, this type of interactivity is particularly difficult to prototype via analog means — even simple known forms like drag and drop “are difficult to simulate” (Snyder, 86). Models that address this kind of interaction may be particularly useful. The import of manipulation is found in Greg Costikyan's definition of games which has proved invaluable to my studies for a number of years. Among a variety of necessary elements he defines two of particular import; tokens and resources. Tokens being the elements of a game that are directly manipulated, resources those qualities that tokens are used to manage. In my experiences however, the distinct between the two is unstable and dependent on the perception of the player. This is an important phenomena I will return to later in the section Manipulation: Definitions. Dag Svanæs's and Paul Dourish's writings on embodied interaction have been very informative. The ambiguities encountered with Costikyan's definitions were echoed in great detail in Svanæs's and Dourish's discussion of embodied interaction. This view, informed by the phenomenological philosophy of Maurice Merleau-Ponty (and others) emphasizes the interrelationship of thinking, action, object identity. Dourish (particularly his descriptions of coupling (138)) and Svanæs's empirical study on the movement of users' locus of attention (133) were particularly useful in providing an empirical and philosophical context to the unstable token/resource phenomena I had long observed. These sources also support the premise that experiential qualities of screen based interaction using the mouse and keyboard may provide generalized understanding of screen based interaction at large. While the proposed model is input device agnostic, the use of such a specific setup has noteworthy implications. By any definition, screen based interaction requires input, and the variety of possible existing input devices is numerous: mouse, multi-touch trackpad, multi-touch screen, tablet, keyboard, joystick, camera vision, etc. In reality, embedded sensors can turn any object — a chair (pressure sensor), salt shaker (accelerometer), or balloon (flex sensor) — into a potential input device. This potential is exciting, but problematic if generalities can not be formulated. If each combination of input and screen are worlds onto themselves, then a discussion of interactivity as it relates to a category of artifacts, as an art form, or as a design discipline is moot. This, of course, is not the case. Interactive artifacts are unified by qualities of the microprocessor — namely, its ability to create, with relative ease, arbitrary relationships between unrelated things across time and space. The commonality of the screen is also another unifier, as some of the most particular qualities of screen based interaction are defined by the screen's infinite plasticity. The mouse and screen relationship is one of inherent disassociation where the consequences of action are displaced. Chris Crawford, in his description of the mouse, implies this trickiness: “User prestidigitation moves a cursor on the screen to a hotspot where further prestidigitation performs some action.” (53) The magical terms are appropriate I think. In everyday circumstances with a mouse and cursor, the relationship to the consequences of our actions is both removed and yet internalized. For this reason I find it a fascinating and easy target of experimentation. Many of the studies in this project attempt to disturb, extend, and transform this relationship in order to make any experiential nuances more pronounced and discernible. The most general description of this relationship, once thrown into contrast, I can only describe as one of self extension or as the search for self in the behavior of the artifact. It should not be assumed that this separation between eye and hand is particular to the mouse and cursor though. McCullough himself finds this separation may be notable in the context of craft, but perhaps not in other activities: “Hand-eye separation may be normal among some sorts of processes, such as playing from a musical score, drawing from the human figure, catching a baseball, and driving a car” (Abstracting Craft 35). He also notes how novel relationships may be desirable. It should also not be assumed that the separation inherent in the mouse cursor relationship is an anachronism superseded by the growing prevalence of touch screens. Perhaps ironically, one selling point of the iPad is a rich library of digital artifacts that are not easily and directly manipulable — specifically, games. The player of Angry Birds — a game whose slingshot mechanic suits the touch screen so well — is compelled by the existence of objects (a tower of blocks and antagonistic pigs) carefully and intentionally removed from the reach of player's newly promoted pointing. What can you do with a Picture Under Glass? You can slide it. That's the fundamental gesture in this technology. Sliding a finger along a flat surface. There is almost nothing in the natural world that we manipulate in this way. Bret is not anti-touch screen though, he is only concerned with the promotion of this paradigm as the end goal and totality of future interaction. The mistake in this ideology of a touch screen future is in mistaking the input for the whole of the interaction. Innovation will require a better holistic understanding of our relationship to the screen, which, I think, can begin by looking critically not at the mouse, but at the extension of self that the mouse (and other input devices) facilitate. From these writings and my experiences it appears that our attempts to locate the consequences of our actions, or ourselves, in the midst of the artificial causal landscape of an interactive artifact may be a defining aesthetic characteristic of interaction. The sense of agency that the traditional definition of interaction attributed to the computer is then a quality of the subjective experience opposed to an external prerequisite for interactivity. As such, instead of defining interaction in terms of reciprocal action, I define single user, screen based, interaction as encountering the consequences of one's own actions. From this my model is based on the most simple of outwardly directed action — manipulation. The definition of manipulation is to handle or control, typically in a skillful manner. The root of the word being from the latin manipulus or handful and manus hand. (It is also the root of the roman Maniple, a division of the army; one considered to be a handful). The term manipulation is also used metaphorically to refer to the control of particularly complex items, and even in a social context. Regardless of the specific use of the term manipulation there's reason to believe that our understanding of the phenomena is built on the less complex, body-centric, understanding of the term (Lakoff and Johnson). There must be an actor with intent. There must be an observable, external entity. The entity must have some observable quality that may change. The observer's locus of attention is on this change. For example; turning my coffee cup so the handle faces me, the entity is the cup, the property its rotation, the intentional value is a preconceived rotation where its handle faces me, the manipulation as a whole the act of transforming its rotation to that of my ideal. While I believe this definition useful, it is problematic in a number of ways that I will spend the remainder of this section addressing. Firstly there is no available method of quantifying intent. It will then be best to discuss the point at which an actor's intent manifests (i.e. input). Next, and perhaps most problematic, is the requirement for a persistent entity with observable qualities. Not only are people highly capable of perceptual shifts that reframe fundamental perceptual starting points such as figure and ground4, but the screen space may present visual forms with computational structures divorced from our common perceptual understanding of them. In other words, the entity-ness of screen based forms is highly dubious. Lastly, detailed psychological investigation of the mechanisms or manner in which a user's locus of attention changes in response to action is beyond the scope of this project. In the coffee cup example, the manipulation is composed of changes in any number of perceivable entities; an arm, fingers, the cup's saucer; without being the locus of attention these do not count as manipulations. That our locus of attention may move between elements or actions of a larger task is a given. If our attention should move from one point in this causal chain to another it may be ambiguous whether this should be described as two sequential manipulations, two overlapping ones, or one manipulation with some allowance for the specifics of our attention. The distinction I will leave open for now. It should also be noted that our visual attention may be distinct from the locus of our agency, and that a visual element may draw out visual attention (through kinetic of visual means) while our locus of attention remains fixed (or vice versa). In the sketch Twins 01 two cursors respond directly to input. However, one cursor vibrates when the user gives no input. Once a user provides input, the behaviors of the cursors switch, the one that vibrates is calm, moving like a normal cursor would, while the other, previously still cursor, follows but with an overlay of wiggling movement. While the vibrating cursor may draw our attention, the feeling of under our control-ness seems to belong to that entity exhibiting behavior most similar to our own; in this case the still, or continuously moving cursor. To describe this I use language from Costikyan's definition of games, in which he makes a distinction between tokens (elements within a game we control directly) and resources (elements or qualities we manage via tokens). This is valuable conceptual tool, but more fascinating is that, in practice, what qualifies as one or the other is subjective and prone to change. This change where perceived agency moves from one element to another I describe as a Token Shift. The study Token Chain is an example that allows users to instigate shifting. In this case though the shifting is outward. The ability to manipulate the cursor at the center of attention is never removed, but instead the consequences of this manipulation are extended; the cursor's status as the focus of the common point and click gesture is shifted through one element to another. As the chain extends, the focus of our attention moves with it. While the entity of the manipulation changes, the specifics of the relationships (input to output) do not. In contrast to the previous study, the experience of use is not unsettling, and in fact is barely noteworthy. The two types of shifts I have described, inward and outward seem dependent on a perceived (if not actual) causal relationship where one element affects those further down the causal chain. In Token Switching attention is pulled towards an element that would otherwise be acted-with unconsciously. In this case it might be said that the change in the actual causal structure outpaces or disrupts our expectations, whereas in the Token Chain the reverse may be true; the change in the actual causal structure follow behind the change in our locus of attention and reinforces expectations. That this shifting is in some way an experiential phenomena with aesthetic dimensions is clear; Its specifics less so. I am unsure, for example, as to whether to describe it as a single manipulation with a changing entity, or two separate manipulations that happen in sequence. An answer would be best based on a better understanding of both the manner in which our locus of attention changes, whether moving laterally between unrelated elements in the same context, hierarchically between causally related elements, or if such distinctions are even tenable. The specifics of this are of great interest to me but beyond the scope of this paper. It is enough here to note that at one point what was once a manipulation of one thing is now a manipulation of another, and that despite being contingent on subjective perception, these perceptual shifts can be instigated by the design of the system. There are several known visual cues that we use to distinguish one thing from another including proximity, connectedness, and sympathetic movement. Things that are close together often go together — or at least affect each other. Things that move together are often seen as part of a surface — typically on a solid object. Kinetic cues and otherwise static visual cues may easily disagree; for example, in an instance where two distinctly separate dots move in unison — imagine a dark night watching a car's headlights from afar. While this conflict in cues might be cause for a little tension, it would hardly be described as off putting or uncomfortable. However, when the simultaneous movement of two, visually distinct, dots are under the control of a user, it's possible — in situations where the distinctness of the dots would imply a difference in behavior — for any subtle tension to apparently increase. In Twins 2ab, either a bar or two connected dots may be dragged within the confines of the space. When the bar's movement is limited by the constraints it seems perceptually neutral, unremarkable, perhaps natural. Whereas when the two dots are stopped by their constraints there seems to be at least a momentary tension, as if we expect the two elements to behave independently. A following study, Twins 02a similarly contains two circles that will move together when clicked and dragged, however each is confined to half of the space. Once one dot collides with its bounds the dot's movement will become restricted whereas the other may continue to move freely. Once one or the other exhibits some independent qualities, there seems to be a release in tension. It would seem that while our mind may give the kinetic and manipulable qualities of a form or forms some precedence in regards to its status as an entity, it does so perhaps grudgingly or with reservations. Another study is built with similar behavior. However, the un-clicked circle has noise introduced into the mapping between the mouse and its position resulting in a wiggling when dragging. At various times, its direction of movement will be either complementary, opposed, or tangental to the direction of input movement and also to varying degrees. The result appears as an ambiguous causal relationship where the tightly mapped dot affects the wiggly one. However, at times it appears as if the dragged dot should be responding to the wiggly one, creating slight tension when the dragged dot doesn't conform to expectations established by the visual relationship. This is somewhat more prominent in Twins 03 where a line is shown connecting the two while dragging. In Twins 04 a collection of dots is used. When a dot is clicked, other dots will move somewhat sympathetically but with limitations. The initially clicked dot is tightly mapped to input and responds immediately and exactly. Another selection of dots will move as if tightly mapped, except they will move in fixed increments of distance (that of their width), and only if the velocity of the input movement is above a certain threshold. They have the appearance, or feel, of being sticky. Another selection of dots moves more continuously, but lags behind mouse input movements. While the clicked dot always responds immediately and continuously, the focus seems drawn to the collection of sticky dots and their somewhat haphazard response. I might describe the overall effect as a tease where we anticipate (or perhaps attempt?) a repeatedly deferred token shift. It may be reasonable to say that in a more complex artifact with many things responding to input, we look for or notice what is at the tip of our conscious control, and that the target of a manipulation may be influenced or redirected by the manner in which the system responds. In the screen space there is nothing inherently manipulable. In reality, the specifics of the inner workings of these creations may be unobservable and have no baring on how we subjectively understand them or attempt to interact with them. The math and logic used to display a black square on the screen are irrelevant to our experience of it as such, unless its computational description has direct baring on what qualities of it are manipulable. For there to be manipulable form, the form — and the manner in which it can transform — must be created. This is typically done through the combination of mathematical expressions and programming logic that defines, in the end, a visual form commonly referred to as a parametric form (McCullough Abstracting Craft 168, Reas et al 93). Such abstract forms have quantifiable parameters that define a range of potential observable forms they may take on. The continuum of forms may be referred to as a possibility space. More interestingly, it is entirely possible for two parametric forms to share one or more specific overlapping visual expressions. At these points a visual form's manipulable qualities may be ambiguous. It may also be possible to switch between two different parametric forms. The quality that was once manipulable disappearing in place of another quality (or even an entirely different entity) without any visual discontinuity. 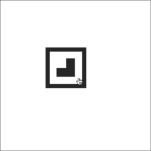 In the study Interactive Figure Ground a rectangle is divided into half white and half black. 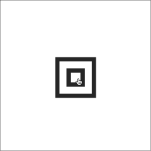 It may also be described as a white square on a black background and vice versa. 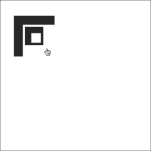 By moving the mouse the system changes from one structure to another at the point of overlap (where the rectangle is exactly half black and half white) (see fig. 1). The study Fidelity is another, slightly more complex, example (see fig. 2). It is also possible for the possibility space of two or more parametric descriptions to overlap at more than one point; even overlap completely. Ring Box allows a user to manipulate a form in one of two possibility spaces; one where the individual parts of the form can be moved via a click and drag, and one where the negative space in the middle may be moved as if it were a solid form. This phenomena is found in almost any piece of software from word processors — allowing for the manipulation of their content as-language (in the case of typing) or as-image in the case of setting type face, type weight, margins and other formatting variables — to 3D modeling programs that support the manipulation of form in terms of points, lines, or surface. In these examples there is a clear continuity of controllable transformation, but if there is a specific entity being manipulated it is somewhat ambiguous. The most general description would be that these are simply parametric forms with unique manipulable qualities. However, these situations where the same or similar action has different consequences could also be referred to as modes (Raskin 37). They may also be described as two forms that support instantaneous transcoding (Manovich, “Language of New Media”, 45) in that the perceived form is bounced between two different mathematical or numerical models (though its possible for a form's mathematical underpinning to remain constant even while a person experiences a perceptual shift). In my definition each study might be described as supporting a token switch between two manipulable forms that have momentary visual similarity, or a switch between tokens coinciding with an overall change in the elements of the artifact. While we may have a single locus of a attention, it may be possible to manipulate multiple things at once so long as we can make some attempt to abstract them into a unit (this comes up later in these section Studies: Drawings). It may be possible that, given an increase in quantity of complexity, the manipulation of a collection of things (even visually continuous things) might become the manipulation of a gestalt level quality of a larger whole. The interaction with Ring Box may be such a phenomena. A detailed analysis of digital form — being that form predicates interactivity — would seem to be a necessity for a proper description of interactivity; unfortunately the variety of parametric form is limited only by the creator's faculty with math, logic, programming and available computational power. While it may be logical, or colloquial, to in turn give something like the pixel material status, the pragmatic view of computational aesthetics emphasizes the algorithms and programming fundamentals — assignment, conditionals, loops, and functions — that change these pixels (Reas et al. 13). Because of this it would be ideal for a definition of screen based interactivity to bridge the language of computation and a perceptual based language of interaction. That the manipulable qualities of form share some perceptual similarities regardless of the specific form is implicit in the phenomena being named at all. It should then be possible to describe, with a common language, changes in a form stemming from a users's conscious action regardless of the specifics of the form. That we are mentally capable of understanding novel forms with novel manipulable qualities (learning software or new game mechanics) implies an ability for abstracted reasoning about causal relationships. As such, it should be possible to enumerate a set of general qualities that describe manipulation. For a model of manipulation to be useful, these qualities should be subject to expression and modification in formalized terms (see Formal Expression). A designer should not only be capable of describing an artifact's manipulable qualities, but also of manipulating these qualities in order to produce a better artifact. The ability for a manipulation to serve as the target of another manipulation may also be embedded into an artifact itself allowing for more complex artifacts with more emergent gestalts. Together this capacity can be described as meta-manipulation. Theoretical implications and difficulties of using a manipulation as the target of another manipulation has implications for the work in the section Studies. The most important aspect of a manipulation as defined so far is the requirement for an entity — specifically a quality of an entity — to be acted upon, and the subjective contingencies of its entity-ness. The ability to manipulate the target of a manipulation can thus be accomplished by allowing a user's perceptual target of a manipulation to ebb and flow in response to the dynamic gestalt. As such, the studies generally utilize a collection of many elements that all respond to input. Concerning quantifiable qualities, I initially focused on what I felt were two intrinsic and readily apparent aspects; that manipulations are generally not instantaneous, and that there typically exists a quantifiable relationship between the observed change and the change at the point of input. By my definition a manipulation has a distinct beginning (the formulation of the ideal state) and end (the resolution of the transformation) — the time between lends the manipulation a temporal dimension. The time between the formulation of the ideal state and the end of the manipulation I describe as latency. Latency is typically defined as the time in a system between input and any response at all. This has been studied in human computer interaction as variation in latency is easily observable when present, and when above a certain threshold it will diminish, if not destroy, the perception of interaction (Swink 45). By the strict definition there is little room for a decision to be made about latency; the lowest latency possible is generally preferable. In my definition however, it may be used to describe manipulations that take more or less time to resolve. I will refine my description of a manipulations temporal qualities later, but for now I'll use latency to refer to the time between first input and the resolution of the manipulation. The second quality stems from the temporal component. As a manipulation takes time, the manipulated quality should then change over time between its beginning and end state. Furthermore, this change may not have a one to one correlation to the input. It need not even be a linear relationship. 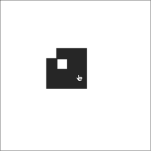 For example, a box may move when a cursor moves, but twice as fast. The specifics of this relationship is generally known as mapping (Norman Design of Everyday Things 23). In order to discover further ambiguities inherit in the model or unexpected consequences of its application I created a series of studies (described in the following section). In applying the model I was forced to articulate manipulable qualities in a manner that was computationally meaningful. Alongside with the studies I began formalizing the model both as a shorthand notation and in the form of a code library that would support the articulation of relationships with increasing brevity and flexibility. In an attempt to touch on mapping I then introduced noise into the relationships between input and position. In doing this I accidentally introduced variation into what I came to call the manipulation's tolerance. As the ending of a manipulation would be qualified subjectively, it follows that some results may be close enough; that in turning my coffee cup to face me, it need not be rotated exactly ninety point one degrees, so long as its new orientation is functional in the context of the initial manipulation. In sketch Latency 03, there is progressively more noise introduced into the both the value space the position values move through, but also the values that they end at. In Latency 03a, the latency from the first studies is removed leaving only the noise in the value space and tolerance. In Latency 04 elements with less latency have more noise in their mapping, and elements with more latency have less noise. The results are peculiar in that the elements are both ill responsive (perhaps frustratingly so if it was in the context of some utilitarian application) but are comforting (for lack of a better word) in distinct ways. Tension is created between immediate but ambiguous response vs. clear, but delayed, understanding. I am not sure if either behavior could be said to better echo the intent or input of the user. Latency 05 swaps the mapping between horizontal and vertical placement of half of the cursors which otherwise have increasing latency. The cursor with the most direct mapping is easily — and comfortingly — found, but the cursor with the next lowest latency draws attention to itself despite the inverted positional mapping. It seems we may rely most on traditionally defined latency to discriminate between the effects of our actions and otherwise independent events. In other words, causal proximity might be more or most important for establishing our locus of attention than visual or kinetic similarity. This could be an area of future investigation. Until now, elements had consistently increasing latency. In Latency 06 the difference in latency between the closest mapped element is relatively high, but the difference in latency between it and the next decreases steadily. The experience of use is dominated by its kinetic qualities, a flurry of action that follows the initial exploratory gestures. Latency 07 is the same as Latency 06, except a property, rotation, is mapped to the direction of movement. Instead of mapping one value directly to another, a property (rotation) is mapped to something more formulaic: the angle between its current position and another position. The distinction between a quantifiable quality of a form as position and a more formulaic or multi-variate property like the angle between two entities is, in reality, arbitrary (as a screen based form, it may be described as entirely formulaic). The distinction is contingent only on the data structures in the programming environment, which may not manifest in clearly observable ways. So there is no real reason to create such a distinction. Here though the distinction between the existent computational qualities and the mental faculty of the artist/designer comes into play. It may be ideal to make manipulable a quality of an element that is clearly perceptual, but has no computational equivalent. For example, the distance between two corners of a box may be relevant to a designer's idea, but have no analogy in the code. Inversely, the computational environment may support properties that are otherwise unapparent to a person, either because of the level of their programming skill, or simply their creative and subjective way of perceiving the screen space. In the end, the cursors' rotation is directly based on input, but appears to be more of an independent quality. In Latency 09a, holding down the mouse button decreases frame rate (or increases traditional latency) non-uniformly. Cursors with more delay have higher frame rates making them move smoothly, while those with less delay have lower frame rates; their movement stuttering. Once the mouse is pressed and held, it appears that the sense of agency shifts towards the cursors that move smoothly, despite being clearly separate from input. Latency 09b and Latency 09c are variations on the way stuttering is staggered. This idea I returned to later in the short series named Finger Studies. In these studies — built from the initial latency studies — an invisible button sits at the center of the screen. In the first study cursors that touch the button change to the familiar finger cursor. In the third however, all the cursors change when the real cursor touches the button. Here, agency is disrupted by the increased delay, but re-asserted once a different parameter becomes immediately manipulable. Latency 11 is similar in concept; the rotation and position of each cursor is directly modified by mouse input with the modification of their positions being delayed. The rotation is specifically driven by the angle to the most tightly mapped cursor position. Here the delay on the cursors' position results in variation in their rotation. In contrast to the previous study, the immediate control over their rotation makes the cursors appear — at least during initial tinkering — to be more independent. This rotation though is also dependent on their positions which, while also driven by user input, are so delayed as to appear independent. In this situation where a change emerges from the combination of perceptually independent activity (the movement) and a dependent variable (the position of the tightly mapped cursor) the result seems lean toward causal separation. Latency 12 was an attempt to have cursors driven by mouse movement in both a delayed fashion and by immediate movements. In other words, the position of each cursor is driven by both the cursor's current position relative to the real cursor and the previous position of the real cursor. The results were ambiguous and had unintentional glitches. Many of the cursors with higher delays rapidly flicker between two positions. Part of the problem was that the concept was computational ambiguous as the statement “make two values affect one” can be interpreted in many ways (see Formal Expression). Latency 13 allows the mappings' latency to be modified by mouse press. Pressing and holding continually decreases the latency resulting in cursors accelerating towards the mouse until they are all moving together. Releasing the mouse button returns the delays to their initial, staggered, values. Lower levels of delay result in mouse trails. The objective at this point has been to isolate and explore interactive qualities to the exclusion of visual variables as much as possible. (Avoiding variation in the studies' kinetic qualities while investigating direct manipulation would be much more difficult if not impossible). The next few studies (14,15,15a,15b, and 15c) look at how any of the relationships in these interactive systems might be retained while modifying or replacing the visual forms related to them. It may be interesting or helpful — as exercises for a screen designer — to switch back and forth between isolated visual properties and numeric properties in order to promote both flexibility in thinking and better understanding of the relationships between an artifact's computational and perceptual qualities. Meta-mapping may be more circular however, at which point subtle ambiguities appear. In Drag Box 01 the cursor affects the box position, and the box position affects this relationship. The box may be moved to a specified point to disable to the ability to move it. Drag Box 01a is similar, but here the box's position may be moved, after the fact, away from the position that results in disabling. The experience in the former, where the relationship between cursor and box is broken permanently seems to engender a slightly stronger sense of agency over the interactive qualities than the latter where the experience is one of constrained action. The formal expression of the relationship (“position affects activeness”) seem to apply to both behaviors. It may be more accurate to say then that the position of the cursor (or mouse) drives both the box and the activeness of that relationship. The cursor then may always move so that the position relationship is restored, and the box returns to its following behavior. In modifying a manipulation it should be possible to also change the property being manipulated. In the first example the mapping is dependent on the input. In the study Box 02 the input changes the boxes's target manipulable quality from position to rotation. As it should be possible to manipulate the characteristics of manipulation's mapping I created another study where the default 1:1 mapping is changed to 2:1 (the output is half the input) when the box's position reaches a specific threshold. The result is a feeling of the box encounters resistance when dragged the wrong way past a point, like dragging cheese along a cheese grater. It also had the feeling of pulling something through a membrane. I was compelled to adjust the visuals to abstractly represent de-boning a chunk of meat. One de-boned, the left over form can be dragged with impunity. As the resulting interaction is at least initially surprising, it's difficult to say that the qualities of an ongoing manipulation are intentionally being manipulated. However, it also seems entirely intuitive to state — once the relationship is apparent — that the box's draggability is a function of its dragging, and that a user who desires to create a 2:1 mapping may do so very intentionally simply by dragging the box to the marked threshold. I suspect that a talk-aloud experiment would show that users describe these behaviors in terms of the computer, or an element in the system, affecting the interaction, opposed to the user stating that they were “slowing down” the box. My question would then be if it is possible, and under what circumstances, for a users' body space, to use Svanæs's term, to expand to include the notion of manipulating the qualities of an ongoing manipulation. Such a conception might be possible but require substantial experience and may constituting the markings of expert level knowledge. There is also research that suggests that people view action and reaction in a relatively discreet number of combinations of an actor performing an action (Pinker 219). It may be that the appearance of resistance is always considered as the result of two parties even if one is inanimate; in such a situation I would be very curious about how the idea of a locus of attention resolves. Thus, describing these behaviors in terms of meta-manipulation may not be immediately intuitive. But it may be more so than translating the behaviors into traditional programming logic. Finally, another distinction that arose in my mind from this study (and from the rotation of the cursors in Latency 11) is between a manipulation that requires constant input to bring it to completion —like dragging — and one that may have a duration but requires only a single, relatively instantaneous, action — like clicking. It seems that two manipulations may require variations in potential input while the the range of values that the manipulated quality will pass through could be identical. As such it would be worth distinguishing between the value space of a manipulation (the range of values the quality of an entity may go through) and the effort space (the range of input or activity required to achieve the result. Traditionally, changes that happen due to user input, but that are not guided by input can be referred to as triggered animation. This will be discussed in the section Formal Expression: Time. Drawing to the screen — albeit repeatedly at superhuman speeds – is the root of screen-based, computer generated, form. Couching computation in terms of the manipulation of things that leave marks is an approach to making programming more approachable, and is similar, if not the same as, the drawing done in LOGO via the command controlled movement of the turtle (see fig. 4). For the purposes of the model presented in this thesis it may provide a way to partially accommodate the plasticity of the screen space. The proposed model contains language that applies to both computational and perceptual contexts — how its use results in emergent qualities may be still be distinct in the two realms. For example, as stated earlier, it should be possible for the manipulable qualities of form to be subject to manipulation — and that current manipulations may affect later manipulations. In computational terms this takes the form of a quantifiable changes to the described qualities of a manipulation. However, in the perceptual realm, the qualities of a manipulation may be contingent on previous ones by virtue of a change in context. Manipulation involved in making the first mark on a page is objectively the same as making the last mark, but the perception of the two actions may be distinct due to the changed context. This is similar to the emergent interactivity I discussed before; where continual interaction and familiarity change the subjective understanding of gestures that have objectively remained unchanged. In the latency studies, different movements often created different kinetic qualities, in the case of drawing, different manipulations create different visual qualities. In another similarity to the latency studies, the following drawing studies allow for the manipulation of a number of mark making entities. They remind me of the childhood activity of drawing with a fist full of crayons. In contrast to this physical activity where mark makers are manipulated as one entity, the digital equivalent allows for a great deal of variety in the way input is mapped to their changes. The results, even more so than the as with the latency studies, is a general perception of manipulating stuff. It make sense to speak colloquially about the manipulation of a range of multiples — singular entity (a hair), collections (hairs), stuff (hair). Computationally, this common desire is addressed through loops where a set of operations on a single item is serialized; the computer's ability to execute the instructions quickly and repeatedly resulting in the perception of something being done all at once and continuously. This approach is useful and powerful, but is also very distinct from the perception of the results. This section looks more closely at the complexities of quantity in the context of the manipulation targets. At this point the implementation of the proposed model (the code library) kept constant track of the change in any value it was watching, effectively granting access to the velocity of things like the mouse position. While I was trying to avoid changing manipulable properties in response to previous actions, I did start utilizing these time based variables to change the pens' mappings. That an entity may have a quality is conceptually reasonable. That a quality may itself have a quality is a little less obvious. However, such real life statements such as “The wheel spun faster” or other changes to an entity's kinetic qualities are perfectly intelligible. It'd also be understandable (if not wordy) to state “mouse position changes wheel rotation speed”. Such a meta-quality like velocity may also serve as an entity as in the meta-meta-quality acceleration: the rate of change of the rate of change of a value. It may be desirable to amend the proposed model so that “a quality of an entity may itself serve as an entity, in which case it has the quality rate of change, which in turn may also serve as an entity (ad infinitum).” While entity-ness is subject to framing and perceptual shifts, it'd be hard to argue that a perceived visual entity, like a box, is experientially similar to the perception of speed–as–entity. Perceptually, it seems more direct to refer to velocity and acceleration as qualities of the initial entity. However, developing a more discerning view is foundational to traditional animation studies. In the seminal Illusion of Life Ollie Johnston and Frank Thomas posit that kinetic phenomena such as slow-in, slow-out (movement utilizing acceleration and de-acceleration) constitute some of the core principles of animation. So, while the expression of kinetic phenomena in meta-quality terms may not be entirely descriptive of a lay person's perception, it may be that developing such discerning distinctions is valuable for the practicing designer. In Drawing 02, the pen's is-drawing-ness is dependent on the velocity of a cursor; fast movements make lines, slow ones do not. There is no is-fast meta quality to velocity though. Fast is relative. To express this, the mapping quality would need modified so that scaler values are converted to binary values. This problem, and ones like it, are a matter of mathematical expression where abstract notation may be unavoidable. In Drawing 04, the velocity of the cursor drives the amount of noise in the mapping of the pens' position; moving the cursor quickly results in lines being draw erratically. In these cases, making the mapping of a manipulation itself manipulable presented a powerful technique for creating variation and more elaborate kinetic qualities, but revealed some issues with the concept of mapping in general. Specifically, if a mapping itself has qualities, what qualities does it have. In Drawing 04 it'd be most accurate to say that the cursor velocity was driving a noise quality of the mapping. To say that the mapping of any relationship has a noise property is problematic however. In fact, to say that all mappings have a common set of properties is impossible. Each mapping seems to require mathematical notation. This will be discussed more in the section Formal Expression: Mapping. The experiential result of these studies is more similar to manipulating a novel, reactive, form than to the experience of drawing. If the older, previous marks, were removed in some fashion, and the user left with just the most recent marks, the results would appear even less as a drawing, and more as reactive or computationally generated form. Computationally generative form, even when it appears static, involves repeatedly drawing and clearing an image space. Combing this erasing — even if behind the scenes — with the delayed and alternatively mapped pen manipulation creates a variety of manipulable form. So far I have only considered the manipulation of explicit entities, but it may be reasonable to look for universal situational properties, or generalized properties of an artifact, such as mark permanence that can be the target of a manipulation in order to allow for these kinds of artifacts. The following studies explore this and similar situations. The final two studies allow the amount of erasing to be controlled by the user. The more compelling one is presented below. In addition to issues in mapping, the drawing studies helped foreground a perceptual distinction between the manipulation of a thing, the manipulation of things, and the manipulation of stuff. Along with this, a personal desire to more accurately describe relationships between one-and-many, and many-and-many. In the early Latency studies it became quickly apparent that while it was possible to focus on a directly manipulable entity in a crowd of similarly behaving items, focus often seemed drawn to the artifact as a whole. Here with the drawing studies, in the absence of any controlled visual entities, this phenomena is more pronounced. Presently, my ideas focus on the manipulation of a thing, or perhaps the manipulation of multiple things where the attention moves rapidly from one to another. The use of a collection of things however gives the artifact as a whole a unified gestalt, but also the sense of manipulating something amorphous and indistinct. Research in linguistics has found that individuals make a particular distinction between collections of items and amorphous stuff (Pinker, 167–174). The perceptual shift from the manipulation of a thing, to things, to stuff is likely not continuous, and could be the focus of further exploration. Regardless, language of manipulation (and its technical implementation) should support the creation of mappings between many things. One potential benefit to a quantifiable model of interaction is the potential to represent and manipulate interactive relationships via a graphical user interface. A full application for the creation and modification of interactive qualities would be an undertaking far out of scope for this project. However, considering how meta-manipulation might manifest in a user interface helped reveal intuitively desirable functionality and problematic issues in formal expression. While the attempt entailed a number of general interface design problems, this section will focus on those issues most relevant to the investigation of the proposed model of interaction. The study Adjustment provides a limited example wherein the latency and mapping of a relationship between two boxes can be changed. As described, mapping may vary drastically, so this example only allows for the a multiplier quality of the mapping to be changed. A more complex interface prototype has also been created wherein the latency and mapping qualities of specific relationships are forgone in order to focus on allowing a user to create causal relationships between elements in the first place. Like the studies, the forms utilized in the prototype would remain simple. While the model is agnostic to the forms being manipulated, I found that restricting entities to primitive black and white shapes useful. Overlapping them allows for easy construction of the kinds of novelly transformable visual forms created by computationally based parametric structures (see fig. 12). In the event that the model is used in a classroom setting, such constraints might be effective in limiting investigation to existing forms (opposed to generative form), while promoting novel visual transformations. Another particular interface problem was the cursor. While it may be easy to form connections between different elements, any interaction is predicated on some kind of implicit relationship between the artifact's forms and the input. A designer would then require some self-reflexive ability to point to the point-of-input — the input which was being used to manipulate the tool in the first place. While an interface that is completely based on direct-manipulation sans hot keys or other accoutrements would be ideal, this introspective need to refer to oneself using the artifact at hand interferes with the potential for a real-time all-the-time editor. There will inevitably arise a moment when a user will need to either suspend the artifact, or step outside of it. Having two distinct modes is unavoidable. The design challenge is then to both minimize the interruption so that a continuous work flow can be maintained yet make the distinction between the two modes clear. (I attempted to minimize the problem here through the use of a quasi-mode where editing requires holding the e key.) Ideally the tool's cursor could become detached from some kind of meta-cursor when entering the edit mode. This requires decoupling the default cursor from mouse or trackpad input, a feature otherwise known as mouse lock, which is currently unavailable at the time of writing in the development environment I began in (Flash). The problem also exists in animation software like Cinema 4D where users can take advantage of both key-framed animation techniques and also physics based animation. In these systems the priority and even weighting given to various inputs can be set explicitly by the user. This would be useful functionality in managing internal relationships between elements that overlap with relationships involving external input values. The solution I pursued was to give changes from outside of the system priority, letting them override the effects of other, internal relationships. In the previous studies, statements about manipulability often had to be translated into the typical computational language of variables, loops, and functions. However, statements made about manipulation should be applicable both perceptually and computationally. A statement such as “the mouse position changes the box position” should have clear computational equivalent with as little translation as possible. This means formalizing perceptual statements about manipulation. This process alone raises new and unexpected ambiguities in the model that may not have been addressed in the previous sections. The simplest formal statement about manipulation might be the one mentioned above. Spoken thus: “mouse horizontal-position drives box horizontal-position”. In these expressions, the left hand entity/property pair is referred to as the driver, the right entity/property pair the driven. (These terms come from the similar functionality of Maxon's Cinema 4D.) The statement as a whole I will refer to as a relationship. In the context of the proposed model, a relationship is the the most basic formal description of an entity's manipulability — the quality that allows for a manipulation to occur. Even the simple relationship above may be interpreted in at least two ways. Interpreted as an absolute relationship, the value of the box position would be a exactly equivalent to the mouse position. Interpreted as a relative relationship, a change in the mouse position would be reflected by a corresponding change in the box position. The previous studies almost always relied on such relative relationships. I find it more intuitive when such an expression results in the behavior “it moves as I move” than the behavior “it sticks to me”. This interpretation also allows for the target of the manipulation (box position) to change to something else (the position of a circle) without the unintended effect of the circle snapping to the current mouse position. This logic is problematic as it does not have a direct computational equivalent in the languages I am familiar with5. It would require either the value of b to be set via calculation each time there was an assignment to a (which would override the assignment to ∆a), or the previous value of a would need to be stored implicitly each time the value of a was set so that use of the variable b would provide the result of the difference between a's current and previous values. A manipulation's latency property complicates things further. As the amount of latency may change, a continuous record of previous values for the driving property will need to exist. A computer program that functions this way would need more storage space the longer the artifact runs, potentially running out of memory. Alternatively, there would need to be a limit to the record of values, thus limiting the value of a relationships's latency to what the resources of the hardware can accommodate. In this case, a change to the first box's position affects the position of box 2 which in turn affects box 1, resulting in an ambiguous feedback loop. I've personally encountered similar problems before in the creation of physics simulations where multiple bodies have concurrent affects on one another. These simulations situations have the benefit of a real world example. Their ideal design is a compromise between accuracy and computational complexity. In the case of abstract cause and effect relationships the slavish reproduction of reality is not a goal, and may actually be detrimental to the creation of innovative causal relationships. In such a situation it may be more ideal to favor how people would interpret such systems to work; in other words, favoring the simulation of naïve physics over real physics6. There is evidence to suggest that our minds organize events in part by attempting to formulate a singular actor that carries primary responsibility for events (Pinker 219). The topic out of scope here; but one of great relevance and potential direction for future research. In the specific case that the feedback loop arose, my personal intention was to state that two items move together as one regardless of which is being dragged, and that each could still be affected independently by other inputs. In order to express such a contingent tying together without creating an implicit feedback loop it may be useful to make a distinction between relationships that are mono-directional and those that are bi-directional; modifying the definition of a manipulation to include a directional quality that can itself be manipulated. However, I find this adds syntactical complexity where emergent complexity would be preferred. The downside of favoring emergent complexity is that designers may have an increased ability to unintentionally create statements with unexpected and undesirable results. Implementing this language required several compromises due to situations like this which may be too detailed for this discussion. One detail is relevant however, in the implementation, change in values external to the artifact, such as mouse position, are always given precedence. In making a distinction between those values external to the artifact and those that are not I found it logical to describe time as an external property which elements of the artifact may depend on. The results of these relationships intersect with time in a number of ways. Relative relationships in particular are implicitly temporal in that they track change over time. In contrast, traditional computational expressions are executed once at a single moment of time. Continuous change comes from their repeated use at specific intervals, such as 60 times a second. A program may control the intervals at which it runs (or unintentionally reduce them through difficult computations), it may also utilize an internal representation of time for manipulation (used to effect in games like Braid) but, like user input, the numeric values associated with the passage of time are external and may not be driven by other properties. Time may, however, serve to drive properties. A simple clock might begin with such a relationship. While such a relationship may not utilize user input, these kinds of relationships may still be valuable in manipulations. Change driven by time is animation. The distinction between this and change driven by user input may be unclear in places. For practical purposes, I'll define animation here as change over time that does not require, nor respond, to continuous input. Interaction through this kind of triggered animation is prevalent. One of the building blocks in Adobe's Flash is the Movie Clip — a user created, self contained animation that can then be stopped, started, or sent to a specific times. There also exists various code libraries (Like TweenLite or jQuery) that allow for specific, computationally driven, animations by making a property of some object a function of time. Whereas hand made timeline animation allows for explicitly crafted animations, the computational approach is often used to create animations on the fly, in response to some input, and modified based on some variables in the system. For example, an animation could be coded that moves a shape to the cursor each time the user clicks. This is not possible via hand made animation. These libraries are noteworthy in that the required information for constructing an animation is similar to that of a manipulation. Both require a target object with a quantifiable property. Both take a specific length of time. The rage of values a property goes through over time may not be linear, but described by a mathematical function. With manipulation the current value of the modified property is dependent on the a user controlled value. In the case of a computational animation, its progress is the contingent value. In this sense, a coded animation of the kind mentioned could be described as a kind of pre-recorded or pre-made manipulation. How this might fit in a perceptual context is not entirely clear to me. I assume that the perception of a moving entity under the control of a user is both perceptually distinct from the passive observation of the same movement, but yet related — just as the object's otherwise static visual characteristics will influence a user's perception. It may be that such a stock manipulation could be representative of an action so practiced that it can be executed without conscious attention, and thus no input is required for it to happen. Regardless, a more robust model of manipulation that takes into account such non-guided changes would be useful. Using time as a driving property also presents another situation in which an object may be driven by two things. Relationships 08 is one experimentation where both time and user input can affect a series of boxes. In it the change in position of the right most block is driven directly by the change in time. The relationship is based on sine creating periodic motion. This box's position is in turn mapped to other boxes with increasingly offset latency and increasing reduction, until the left most block which is entirely unaffected. The left most block is then directly manipulable. It's position also drivers the other blocks. The result is similar to a jumping rope held by two people at opposite ends. Another example where manipulations that intersect time is when the kinetic qualities of an object need manipulated. This involves the manipulation of a relationship's mapping. Computationally, a relationship's mapping property is expressed as a mathematical function. Such functions can take an endless variety of forms with a endless variety of potential properties and result in a variety of behaviors. Relationships 13 contains some simple examples. In it are five boxes each draggable but in subtly different ways. The most generic mapping function is linear. It relates one input value to one output value. i.e. If the cursor's x position is ever 100, the mapped value is guaranteed to be 100; if the cursors's change in x position was 10, the change in the mapped value is guaranteed to be 10. This problem becomes more difficult (or interesting) when additional free parameters are allowed to enter the equation. These equations are known as parametric equations as they describe a range of linear equations, just like parametric forms describe a range of form. The above can be used to calculate the current value of something animating where s is the start value, e is the end value, t is the elapsed time, and d is the duration of the animation. The variety and non-overlapping nature of these equations that describe a potential mapping prevents the creation of a set of convenient, manipulable, properties to manipulate. In this situation, the need for abstract mathematical expression seems unavoidable — unless mapping is to be constrained to specific, predetermined formats. Providing a catalog of equations is one approach and is utilized by some animation software such as Adobe Edge and in Flash (specifically with the use of a motion tween). Other software, such as Adobe After Effects, creates a graphical representation of the function and allows for it to be manipulated as a bezier curve. I find this far more intuitive and flexible. This approach is far from the discreet symbolic notation however, and would require an editor to accept such visual input, or, automatically generate the mathematical description of such a curve. As mentioned, a manipulation has qualities of its own (target, latency, mapping). Thus relationships should have properties that themselves can be driven via another relationship. Here the the latency of the relationship between the mouse position and box position is driven by the mouse's vertical position. As discussed previously, in the event that a user's perception of the target of a manipulation shifts, it is ambiguous as to whether this should be described as the change in target of a persistent manipulation, or the abandonment of one manipulation for another. Such changes may be encouraged by objective changes to the chain of causality. Noting these potential manipulations (such as “the box or the circle can be moved”) may be desirable. One approach is to notate them as above, and allow them to be alternately activated, specifically through the inclusion of an active or a suspended property. In the above case it would be useful if the entities themselves had properties such as pressed and touched that can be used to drive the activation of mappings. These kinds of properties are examples of multi-variate properties — properties that consist of the result of other simple values, in this case a set of calculations concerning the distance between a two dimensional point and the geometric bounds of the visual entity in question along with the binary ‘mouse button down' value. The use of such combinatorial statements allows for many to one relationships and should be supported by any implementation of the model. Two examples of simple interaction built from such basic clauses exist in the studies Clauses 01 and Clauses 02. While this approach is functional, it should also be possible to have the target of a mapping itself be the target of a manipulation. The formal expression of this is ambiguous however. The following statement expressed that a box's pressed-ness drives the target of a relationship. This may appear to make sense, but it fails to express how, exactly, the box's pressed-ness affects the target of the relationship. Does it mean the target becomes another box? Which one? It is highly ambiguous. I believe a proper formulation requires the use of an abstract entity that represents multiples. A set is a mathematical concept of both great simplicity and great depth. While a full discussion is far out of scope, even the basic idea can be invaluable when dealing with multiples, particularly in terms of manipulation. Where people can deal with quantities as a singular entity, computers — baring multi-threading — modify many pieces of data not at at once, but sequentially, and very quickly. Loops and recursion are the de-facto tools for describing these repeating processes. The ability to have a computer do such repetitive tasks is arguably their most powerful and distinct qualities as a tool or medium. However, understanding the consequences of a looped process is difficult when the loop may run tens of thousands of times over the course of a second. For example, it's easy to understand the result of taking a step, or ten steps, but predicting your location after 15,000 steps may be challenging without calculations. For some operations it may be more ideal if the language could provide a more intuitive method of dealing with quantities. Some design decisions, like using the mouse position to drive the rotation of 100 squares, should be accomplished with brevity and elegance. This requires a method for articulating and resolving selections, e.g. “All the squares”, “All the black squares”, “All the squares to the left.”. Alternatively, an ability to label, create, or set aside arbitrary selections for future manipulations may also be useful, and a potential necessity for dealing with the variable target of a manipulation. CSS also supports making references to implicit collections of things such as “The first child elements of all of some type of element”. This allows for stylistic statements such as “make the first line of any paragraph italic”. The items in such selections is mutable; if the column width of the paragraph changes, the style rules will apply to those words currently in the first line, opposed to those words that were initially in the first line. There are other technologies that include similar abilities such as the ECMAScript extension E4X for working with XML documents and the relatively complex but powerful Regular Expression syntax for use in finding selections in a text such as “any number that is preceded by a bullet point”. The power of sophisticated selection abilities are seen in user interfaces too. Many existing tools, particularly 3D modeling applications, provide a variety of approaches to dealing with large quantities of manipulable items, usually in respect to their geometric relationships. Modelers are often provided with ways of selecting continuous loops of polygon edges or the creation of weighted selections of points where specific relationships are mapped more or less tightly based on the a specific point's distance from an initial click. As the set stands in as a proxy for any relationships to its contents, such selection qualities could be used to manipulate the target of other relationships. Here the entity that the horizontal mouse position affects is subject to the vertical position of the mouse, and thus the target of the manipulation is manipulable. Further research into both the ways in which we perceive collections of entities and their spatial relationships, and computational methods of describing groups would be useful to discover both what is most useful, and where common sense descriptions translate ambiguously into computation. For example, the desire to change the rotation of a set of boxes might translate to either the rotation of each box, or the transformation of the boxes as if it were a single object. The functional result of these relationships is similar to functionality offered (as supporting tools) in various animation suites. Adobe's After Effects animation and video editing software provides a pick whip tool on each layer that allows one to be parented to another so that transformations of the parent layer affect the child as if it were contained in the parent's co-ordinate system. This tool can also be used to create absolute relationships between different properties of a layer so that one quality might be adjusted through the manipulation of another. As previously mentioned, Maxon's Cinema 4D (a 3D modeling and animation suite) supports the kind of relative relationships through the options set driver and set driven accessed by a right click on any numeric property. As useful as these tools are for animation, I believe an application based primarily on these kinds of tools would be even more valuable for prototyping interactive artifacts. The studies demonstrate that descriptions of an artifact's manipulability in terms of simple causal relationships may engender experiences of use that are more sophisticated, emergent, and/or complex than those typically attributed to a manipulation. However, it's ambiguous if the engendered experiences would qualify, for a lay person, as manipulation, interaction, or something in between. This section will better describe how an interactive artifact may be more or less interactive and the ways in which the studies are both perceptually successful and deficient. The model's requirement of intent as part of manipulation may be seen as problematic in the context of the studies. Intent may only exist where a desired end state can be envisioned along with the actions necessary for producing it. The studies though are characterized by mildly unexpected behavior and have no explicit goal or use. As the target of a manipulation and the observable quality being modified are subjective, it may be possible to describe an initial manipulation in terms of “I intend for the composition to change”. In other words, the artifact as a whole is the target of the manipulation, a general quality such as composition being the target property, with a desired result marked by an exceptionally high tolerance (acceptable variance in the end state). Through such manipulations the user's understanding of what actions have what consequences is refined and their understanding of the artifact is clarified; A process definitive of active encounters. Intent has further implications in the computational domain. Manipulation, like interaction, arises from a subjective encounter with an artifact and may not be explicitly designed, only designed for. Thus intent can not, and should not, be expressed in the computational definition of the artifact. Instead, the potential for manipulation is expressed in terms of causal relationships. Crafting of an interactive artifact is thus distinct in that it involves crafting artificial causal relationships. Baring utilitarian uses, an interactive artifact may then be evaluated by the degree to which its manipulation reveals embedded causal structures and possibilities for more, or different, kinds of manipulation. This kind of procedural self expression can be found in puzzle games such as Windowsil by Patrick Smith (aka. Vector Park) or games like Jenova Chen's Flow that simply do not provide explicit instructions. If the revelation of causal structures diminishes, so then does the object's interactivity. Thus an ideal interactive artifact should continue to reveal new causal structures either through introducing objective changes in response to use, or, being crafted in such a way that the player's understanding of the system changes. In this sense, this project's studies are relatively more interactive in that use exposes unknown, unexpected, and/or surprising causal structures, but relatively less interactive in that they do not do so continuously. It is clear that a user's impression of the target of a manipulation can shift around in a variety of ways, but the specifics of this ability or less defined. A perceived target may be move in terms of mechanical distance, “this affects that which affects that”, through perceptual contexts “this small change affects the overall quality of a unified gestalt” symbolic contexts, “this act means this which means that”. It may also move laterally, from one perceived entity another. Is there a cognitive description for these phenomena? Does it make sense to talk about a manipulation as a mental construct, and if so, how flexible is it? Does it make sense to speak of our understanding of a cause and affect relationship as ending or being reconfigured? Is it easier for us to move in and out of contexts or between lots of different items in the same context? Do specific kinds of token switches contribute more to an artifact's perceived interactivity than others? Are these questions a matter of personal preference or cognitive abilities? Studies in the perception of action or in cognitive psychology in general may be useful to direct future work. One specific perceptual problem is in differentiating the experience of interaction vs. the experience of passively viewing kinetic media. Interaction requires change, direct manipulation requires continuous change, and continuous changing visual will necessarily have have kinetic qualities that affect our perception. In my studies I attempt to minimize visual distinctions, but removing kinetic differences may be impossible. While it's apparent there are distinctions, the manner in which they contribute to the dynamic gestalt is ambiguous. Studies with other inputs would be useful. For example, utilizing a touch screen to produce similar experiential phenomena would help show that the model is device agnostic — or not. It would also be interesting to look at the model in more symbolically rich contexts. How can token switching be designed, for example, with a collection of signs? In this vein, it may be easier to use the model to evaluate existing artifacts, or perhaps compare the ideal of continuous reveal to other aesthetic ideals such as Jonathan Blow's idea of orthogonality in game mechanics. In formalizing the language, I've found that the need to formulate persistent relationships may be better achieved through a functional programming paradigm typified by lambda calculus, and found in languages such as Haskel, Scheme, and the more recent Clojure. This is opposed to the imperative programming approach that underlies many languages presently used for creating screen based interactivity such as ECMAscript languages or those derived from C.
These potential avenues of research are generally limited to the scope of this project's questions; The role of manipulation in multi-user situations is hardly a conceptual stretch, but would be a valuable area of study. What happens when two people attempt to manipulate the same thing? How are people's attribution of agency in multi-user environments related to how they attribute agency to the computer? The increasing prevalence of multi-user artifacts makes questions like these increasingly relevant. While this study is limited to finer details of the relationships between a person and their screen, it is my hope that a sensitive understanding of these single user nuances can eventually inform the exploration of these more complex issues. 1 Many systems exist for building interactive artifacts from pre-existing components and/or pre-existing behaviors. However, these solutions often represent a limited realm of possibility and promote convention over innovation. 2 Better looking artifacts are often perceived to work better (Norman Emotional Design 17). 3 Not a consensus view. Chris Crawford strongly dismisses the use of narrative techniques like storyboarding (156). 4 See classic optical illusions such as the Duck / Rabbit or Old Hag / Young Lady. 5 However, there are languages such as lambda calculus (that I am only now familiarizing myself with) in which such statements may be more tenable. 6 For a discussion of naïve physics, see Norman's Design of Everyday Things, pages 36–38. Brathwaite, Brenda. "Built on a Foundation of Code – Game Edu Rant". Applied Game Design, 2011. <http://bbrathwaite.wordpress.com/2011/03/01/built-on-a-foundation-of-code-game-edu-rant/ >. Brooks, Frederick P. The Mythical Man-Month: Essays on Software Engineering. Anniversary ed ed. Reading, Mass. : Addison-Wesley Pub. Co., 1995. Buxton, William. Sketching User Experience: Getting the Design Right and the Right Design. San Francisco, CA: Morgan Kaufmann, 2007.
Cooper, Alan. The Inmates Are Running the Asylum. Indianapolis, IN: Sams, 1999. Crawford, Chris. The Art of Interactive Design: A Euphonious and Illuminating Guide to Building Successful Software, June 2002. San Francisco: No Starch Press, 2002. Cypher, Allen, and Daniel Conrad Halbert. Watch What I Do: Programming by Demonstration. Cambridge, Mass. : MIT Press, 1993. Gingold, Chaim. "Catastrophic Prototyping and Other Stories". Levitylab, 2011. January 2011. <http://www.levitylab.com/blog/2011/01/catastrophic-prototyping-and-other-stories/>. Hannah, Gail Greet. Elements of Design: Rowena Reed Kostellow and the Structure of Visual Relationships. Princeton Architectural Press, July 2002. Lopes, Dominic. A Philosophy of Computer Art. London: Routledge, 2010. Löwgren, Jonas. Five Things I Believe About the Aesthetics of Interaction Design. Dagstuhl Seminar Proceedings, Schloss Dagstuhl - Leibniz-Zentrum für Informatik, 2008. Löwgren, Jonas, and Erik Stolterman. Thoughtful Interaction Design: A Design Perspective on Information Technology. Cambridge, Mass. : MIT Press, 2004. McCullough, Malcolm. Abstracting Craft: The Practiced Digital Hand. Reprint ed: The MIT Press, 1998. —. Digital Ground : Architecture, Pervasive Computing, and Environmental Knowing. The MIT Press, 2005. Naughty Dog. Uncharted: Drake's Fortune. Sony Computer, Sony Entertainment, 2007. Playstation 3. —. The Invisible Computer: Why Good Products Can Fail, the Personal Computer Is So Complex, and Information Appliances Are the Solution. Cambridge, Mass. : MIT Press, 1998. —. Emotional Design: Why We Love (or Hate) Everyday Things. New York: Basic Books, 2004. Raskin, Jef. The Humane Interface: New Directions for Designing Interactive Systems. Reading, Mass. : Addison Wesley, 2000. Reas, Casey, and Chandler McWilliams. Form+Code in Design, Art, and Architecture. Design Briefs. 1st ed ed. New York: Princeton Architectural Press, 2010. Saffer, Dan. Designing for Interaction: Creating Innovative Applications and Devices. Voices That Matter. 2nd ed ed. Berkeley, CA: New Riders, 2010. Salen, Katie, and Eric Zimmerman. Rules of Play: Game Design Fundamentals. Cambridge, Mass. : MIT Press, 2003. Sharp, Helen, Yvonne Rogers, and Jenny Preece. Interaction Design: Beyond Human-Computer Interaction. 2nd ed ed. Chichester: Wiley, 2007. Shneiderman, Ben. Direct Manipulation : A Step Beyond Programming Languages. The New Media Reader. Ed. Noah Wardrip-Fruin and Nick Montfort. Cambridge: MIT Press, 2003. Snyder, Carolyn. Paper Prototyping: The Fast and Easy Way to Design and Refine User Interfaces. San Diego, CA: Morgan Kaufmann Pub., 2003. Svanæs, Dag. Understanding Interactivity: Steps to a Phenomenology of Human-Computer Ineraction. Trondheim: Norges teknisk-naturvitenskapelige universitet, Institutt for datateknikk og informasjonsvitenskap, 2000. Victor, Bret. "A Brief Rant on the Future of Interaction Design". worrydream.com, 2011. May, 2012. <http://worrydream.com/ABriefRantOnTheFutureOfInteractionDesign/>. Ware, Colin. Visual Thinking: For Design (Morgan Kaufmann Series in Interactive Technologies). illustrated ed: Morgan Kaufmann, 2008.